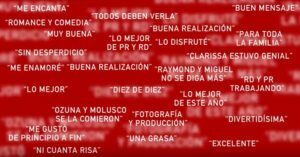 After its amazing hit on Latin America and now on the United States, the movie Qué León keeps the success on every cinema, and recieves a lot of good reviews. A lot of you may be asking… what made this movie so famous? How was the marketing strategy behind it? Here, from Spanglish Movies, we’ll tell you how this strategy was. First, it’s perfectly clear that one of the most valuable items for this movie was one of its leading roles: trap and reggaeton singer, Ozuna, was one of the key values to make this movie so popular. His songs are a big part of Qué León‘s soundtrack, and thanks to that we put together a Spotify playlist with its score, where people can find songs such as “Una Vaina Loca”, “El Farsante” and “Dile Que Tú Me Quieres”. This movie also had publicitary spots on big basketball games on the United States, played on Madison Square Garden, a place with a really big audience. We also had promotional visuals and trailer presented on F.O.A. 2018, in Santo Domingo, Dominican Republic. Across Latin America, several movie theaters placed POP material on their combos with movie pictures and its logo, and we made a social media challenge to win special passes to the movie premiere. We named it #RetoQuéLeón, wich translates to #QuéLeónChallenge. Participants took pictures with sodas or photos related to this movie and uploaded them to their social networks. On Youtube, trailer reached more than 2.8 million views. Instagram’s publications about the movie reached also more than 2.7 millon likes and on Facebook more than 1 million. Mouth to mouth strategy was the most successful one! Every person that came out of the theater recommended his friends to go watch it. Every review had good comments, such as “everyone should go see it”, “amazing comedy movie”, “liked it from start to ending”. We also counted on media tour through television. TV Networks such a Univisión (El Gordo y la Flaca’s show) and Caribbean TV made special reports about the making of, and the premieres of the movie. They were a key boost on publicity. Thanks to them we reached more than a million latin and american families across the globe. It has been quite a journey but amazing to Spanglish Movies family. We are really proud for the success around Qué León movie. It’s still growing and gathering good reviews, so we’d like to thank every person that has bought a ticket to watch it!